It’s that time again to share my monthly process art program for ages 3-7! This month we focused on Chinese New Year. Process art is focused on the act of exploring creatively, and not on the final outcome. We want to encourage the kids to have fun, try new things, and not compare themselves with others. It helps the kids find their own artistic voice. This program is about celebrating their individuality by giving them the freedom to be. They’re Learning! Process art offers an opportunity for children to strengthen their fine motor skills, learn about different aspects of art, and is a perfect segue for exploring other subjects. What We Read: We started out talking a little about Chinese New Year.I shared a few fun facts about the holiday and traditions.To celebrate it being the year of the dog, I chose It’s Only Stanley. 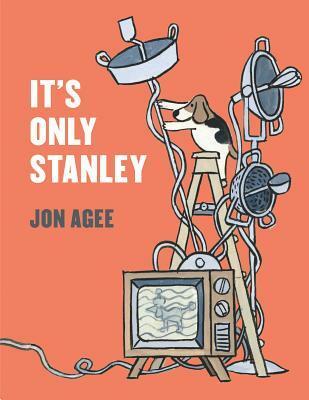 It follows the family dog, Stanley, who is singularly focused on meeting his love interest. Did I mention she is a poodle currently located on the moon? The kids really enjoyed watching Stanley’s grand plan unfold. What We Did: Since dragons represent good fortune and prosperity for the new year, I thought it might be nice to try out this printmaking idea I found on pinterest. Affectionately known as “squish dragons”, this is the perfect activity for teaching the concept of symmetry. I demoed the activity, and made sure to tell the children that they can make dragons OR anything else they would like. Maybe they want to create what they feel thankful or lucky for? Maybe they want to make nothing at all. Everything is fair game, as long as they are having fun and trying new things. Bling: Googly eyes, raffia, feathers, etc. Step one: Fold you paper in half, and paint one side. Step two: Fold the clean half of the paper back over, press lightly, and open. Voilà! Super awesome dragon! Final Tips and Tricks: I don’t have a drying rack at my library, nor do I have the ability to let the families come back for their pieces later, so I brought a blowdryer and had my awesome teen intern flash-dry each piece that the kids brought to the “drying table”. It sped up the process and definitely pleased the caregivers. I highly recommend this project and will be using it again in other programs! I might even try it with tweens and teens since my intern said it was “pretty cool” which is high praise from a teen. Please share your own success stories, questions or comments below, and as always, thank you for reading!